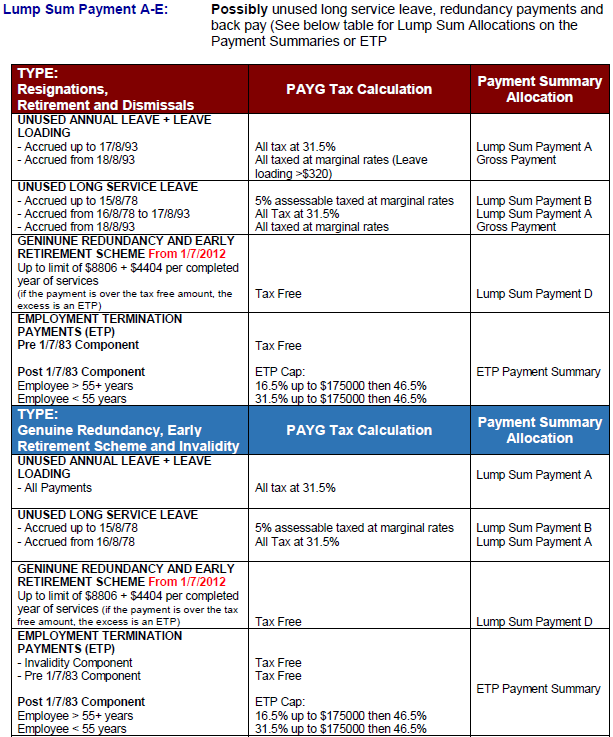 When you terminate an employee, you have to make an adjustment on the amount of tax paid. The Early Termination Payment (ETP) is taxed at a different rate depending on the age and length of employment. It could be between 16.5% and 46.5%. Please see the Criteria for Whole of Income Cap. Please see the Preservation Age table. The amount payable should be checked with your Accountant. There is a limit to the amount of ETP that qualifies for the lower rate of tax (called the cap). Unused Sick Leave, RDOs, Long Service Leave and Holiday. Check the employees Accrued Sick and Holiday pay. Create an Unscheduled PayRun and click into the terminated employee. Click the Add Tax Line button, enter a description, press Enter then type a negative number that will ensure the tax is calculated to the correct amount determined with the tool. Click on the Lump Sum column header to edit lump sum payment amounts. Enter the amounts to the applicable lump sum option (A, B, D or E). For lump sum A amounts, you must apply a termination type: R or T.
T – payment for any other reason. The following data is from the ICB.